LIBeerGuide wishes all of our readers a very Happy Thanksgiving. As 2017 heads into the home stretch, we have much to be thankful for in the world of great beer on Long Island. Craft breweries are expanding, new craft breweries are opening, great festivals and events are happening all the time, and craft brewers and homebrewers are experimenting and brewing up some awesome beers! Moustache Brewing Co. is quadrupling the size of their brewery, taking over the whole building on Hallett Avenue where they first opened in 2014. The expansion to 5,600 square ft. will include a 30 ft. bar in a 1,200 square ft. tasting room, which is almost as large as the entire current brewery. The new tasting room is expected to open in early 2018, with the current tasting room staying open through renovations. Moustache continues to win rave reviews for its wide variety of flavorful and memorably named beers, many of which are available in cans but only in small quantities. To find out when new cans are released, your best bet is to join Moustache's Society for Fine Liquid Provisions, which gives members monthly growler fills or four-packs of cans, birthday perks and access to exclusive, member-only beers on tap in the tasting room. The memberships can be purchased at the brewery or online, and make a great holiday gift. 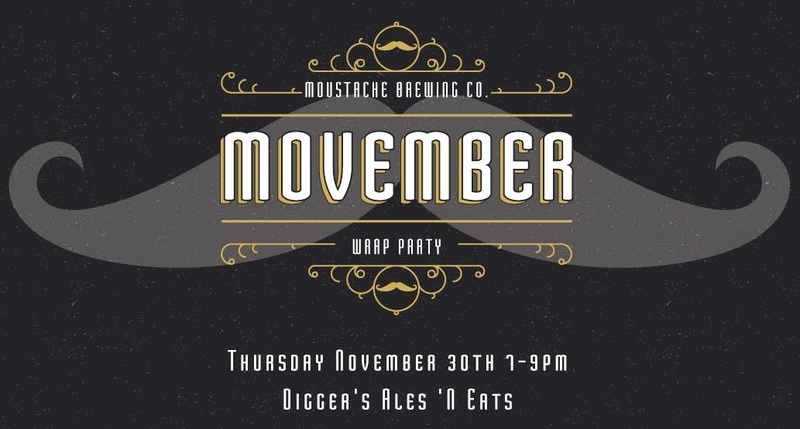 Not suprisingly, Moustache has been active during the month of no-shave Movember to promote men's health, and will have a wrap party at Digger's Ales 'N Eats in Riverhead on November 30 with a tap takeover and awards for best moustache and other categories. Moustache recently held a fun tap takeover on November 18 at Heneghan's Tavern in Point Lookout with a full slate of Moustache beers paired with delicious apps. Down the street from Moustache Brewing in Riverhead, a new craft brewery, North Fork Brewing Co., is planning to construct a brewhouse and open a tasting room by early 2018 in the same renovated firehouse where Long Beard Brewing is building its brewery and tasting room. Long Beard founders Paul Carlin and Craig Waltz are making good progress and also hope to open their tasting room in early 2018. North Fork Brewing was founded by local brewers Peter Barraud of Baiting Hollow and Ian Van Bourgondien of Southold. Patchogue will soon have a third craft brewery, as Patchogue Beer Project is building out its brewhouse and tasting room and hopes to open in early 2018. The new brewery will be located directly across the street from BrickHouse Brewery. Patchogue Beer Project is licensed as a farm brewery and is a partnership between Ryan DeSpirito, a restaurateur from the North Shore, and Mike Philbrick, founder and brewer of Port Jeff Brewing. Philbrick will oversee brewing operations but will hire a head brewer for Patchogue Beer Project, which is independent from Port Jeff Brewing. HopWins Brewery in Bay Shore is doing a crowdfunding campaign on Indiegogo to raise funds to expand their brewery, Co-founders Bill Hoppe and Steve Winn, with full support from their wives Rhiannon and Jennifer, have secured a location in the same industrial park where Brewers Collective Beer Company is located. They hope to complete their brewery and open a tasting room in 2018. 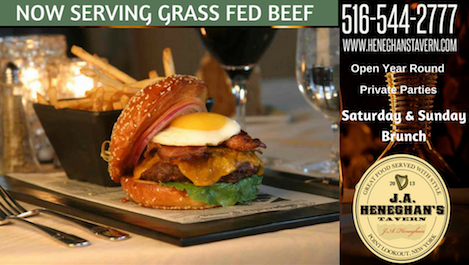 More info on the Indiegogo campaign is available at HopWin's Facebook page. Two other Long Island craft breweries are teaming up in Nassau County to build a new brewery and tasting room that they will share. Long Beach Brewing Co. and Flying Belgian Brewery will be located in an industrial building on Lawson Boulevard in Oceanside. The two breweries will take turns brewing on the planned 7 barrel system and will also share the tasting room, which they hope to open by summer 2018. Long Island’s craft breweries are getting ready for the cold by brewing hearty winter ales. Blue Point Brewing’s Winter Ale was one of the first seasonal beers introduced after the brewery was founded in 1998 and became available in six packs in 2005. This amber ale uses crystal and chocolate malts to add a robust flavor and weighs in at a warming 7.7% ABV. Long Ireland Beer Co. in Riverhead brews its Winter Ale with five different malts including Honey Malts and Cararuby for a deep ruby-red color and uses ginger, allspice and cinnamon for a spicy finish. Great South Bay Brewery in Bay Shore started brewing its Sleigh Ryed Winter Ale soon after the brewery was founded in 2010. Head Brewer Greg Maisch got his inspiration from German rye beers, known as Roggenbiers, which use rye malt to give the beer a pronounced spiciness. His recipe uses 28% malted rye, along with roasted barley malt for a deep amber color and whole juniper berries added to the boil for a piney finish. One of the most fun ways to sample Sleigh Ryed Winter Ale is on the annual pub crawl organized by Tapped Enterprises, which will be held this year on December 2. Great South Bay brews special cask versions of Sleigh Ryed that are sent to some of Long Island’s best beer bars. This year’s 7th annual crawl will visit the Tap Room in Patchogue, T.J. Finley’s in Bay Shore, South Shore Dive in Sayville and Maxwell’s in Islip. Two of Long Island’s newest craft breweries are getting ready to brew their winter ales for the first time. BrewSA Brewing, which opened on the Nautical Mile in Freeport this spring, will have a winter ale from head brewer Wayne Milford on tap at the brewery’s tasting room beginning in December. Joe Curley, founder and brewer of Tweaking Frog Brewing Company, is brewing his first ever Winter Warmer on the brewery’s new 10 barrel system in Jamesport, which they share with Jamesport Farm Brewery. The name of the new beer will be chosen from a contest held at the Wet Hop Festival in September, with the winners taking home growlers of the brew.